The British Embassy Maldives issued this statement on the vote in the Maldivian parliament on 27 March. 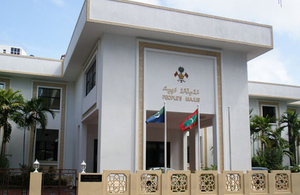 The irregularities surrounding the vote in the Maldivian parliament on 27 March are concerning. The United Kingdom believes that a clear and transparent parliamentary process that is open to public scrutiny is fundamental in a healthy democracy. Against the worrying backdrop of continued intimidation and harassment of media, political opponents and civil society, we urge the Government to respect parliamentary processes and to restore freedoms of expression and assembly.